I Kill Spammers: What Is Going On At Bulker.biz? What Is Going On At Bulker.biz? As many of you who follow my blog know, Bulker.biz (more recently known as "bulkerbiz.com" due to coincidental shutdown of their previous domain in November 2008) is a spam-friendly affiliate I've talked about quite a bit. The list of illegal acts they routinely take part in is available in the spamtrackers wiki entry devoted to their most popular spammable illegal online pharmacy My Canadian Pharmacy. I noticed that rather suddenly, they have decided to secure their current affiliate portal, replacing it with an authorization setup, and a default message indicating they are changing their name yet again. To see what it used to look like, even a mere four days ago, check out the Spamtrackers wiki entry here. That ICQ address belongs to an individual who used to post on a variety of forums, notably Russian ones, using the username "ebulker". He specifically mentions in most of these postings that bulker.biz "doesn't care where your traffic comes from", indicating that they're very much aware that they spam illegally. But really, spamming is just the tip of the iceberg. These guys break so many laws on a daily basis that it's hard to believe nobody's gone after them. It would literally be like shooting fish in a barrel. Firstly sorry for my english cause i am not native. I just wanted say thank for your blog i encountered yesterday. Why do i say thanks? It's because during 1 month i studied with pharma shop.Firstly i thought there is nothing illegal to sell i am just agent between customer and my main drug shop and as main shop mentioned all products are approved by Indian FDA. I thought ther is no sense to worry about. For that period of time i did several sales approx- 20. I had standart design of site which was provided by my main shop and i wanted to change it due to alot of affiliates had it. During thinking about new site design i first seriously noticed attention on word "no prescription required" i didn't notice before cause in my country you can buy VIAGRA and CIALIS without prescription and i thought it works also for another country besides since product is being delivered from INDIA to cutomer and as i know you can buy VIAGRA and CIALIS from IDIA without prescription then there is no anu illegal actions. And several days i was upset about it and tried to find some info in the internet. But i persuaded myself its not illigal all the time when i finally came across on your site yesterday and the truth you wrote on this site was absolutely obvious and bitter. So i removed my shop from my hosting and decided to stop any activities regarding illigel pharma. NOTE: but i so far want to continue to do money using Internet but do it ligally. 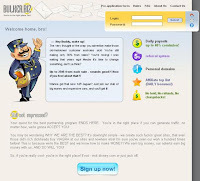 I faced with such affiliate program can you tell me are they ligal? Cause when i sent them letter where i asked him this question they said:"Yes, all of our products are legal to sell in the United States as well nearly 200 other countries. You needn't worry about negative legal ramifications from selling any of our products." Also can you say me what are ligal ways to earn money using internet? - Either hire a pharmacist yourself, or engage one to process prescription approvals. At least one, in fact. It is illegal to sell most of the products these criminal affiliate groups are selling without the advice of a pharmacist, and especially without any prior knowledge of your customers' potential health problems which could cause severe reactions to one or more of the products your site would aim to sell. - If you don't live in the US, you likely will require someone to do these things on your behalf. It sounds like you are located in Russia. You will likely need to hire staff which are based in the US, and (again) hire a US-based pharmacist to approve, process, or (and this is important) deny prescriptions on behalf of your company. - Provide the legitimate versions of the products being ordered. Real Viagra. There is no "generic Viagra". There is no such legitimate product as "Viagra Pro". Same goes for Cialis. - Spend money on accreditation services such as Pharma-Checker, and employ their methods for showing their logos on your site(s) You can't just slap up any logo you want and claim you are legitimate. You have to have actual accreditation from these groups. - Spend money on at least one secure server certificate. - Obtain one or more legitimate (i.e. : not "high-risk") merchant accounts with Visa, American Express, and / or Mastercard. - Maintain a small number of GOOD urls which don't disappear within 48 hours to promote and sell your products. Market them properly and people will remember them and become return customers. They will do this because they probably also registered with your site and received approval from your pharmacist(s) to purchase the drugs they required. - Don't sell these products in excess amounts. Again: know your customers' medical and pharmaceutical history, and - repeat! - hire an accredited pharmacist! - Don't use shady "drop-shipping" services. Use legitimate shipping companies and clearly label your packages when shipping these products. It should be clear where this is coming from, where it was manufactured, etc. All of this should be fairly obvious to anyone attempting to start a legitimate pharmacy business, online or otherwise. If I want to sell explosives to people I can't just build a website, host it on some fly-by night domain (sdsfqewetdsfstufy.cn, for example) and claim I'm legally registered to sell these when I am not. The same goes for pharmaceuticals. These are products which your customers will be ingesting in the hopes of assisting with some medical issue they are experiencing. Think about that and use your brain. If you want to risk potentially killing your customers, keep looking for cheap, illegitimate pharmaceutical affiliate programs like Bulker.biz or Spamit.biz. It will catch up to you one way or the other. If you can't fulfill any of these points, you should consider getting into a different line of work. If your focus is purely "how can I profit quickly", you are already barking up the wrong tree. Markethealth.com have been in business since 2003, and don't appear to operate an "invitation-only" scheme for their affiliates, which right off the bat indicates that they are more legitimate than the likes of bulker.biz or Spamit.biz. Prior to that year, and dating back to 1998, they were known as the "Joebucks" program, which also was a legitimate, accredited pharmacy affiliate program. Keep in mind that they actually only market "Health and Beauty" products. They don't claim to offer any controlled substances or addictive painkillers. Nor should they. That would be illegal without a lot of extra steps for their customers to take while ordering, which you'll notice all of the black market affiliate programs don't do. They also have what appears to be a very robust affiliate agreement, and a separate and very explicit merchant agreement. They also specifically and explicitly do not allow spamming of any sort. Finally, their merchant and affiliate form make specific reference to the fact that you must gather customer's medical and pharmaceutical information in order to market on their behalf. All of this fits with a legitimate online pharmacy operation. If you don't believe their claims, they should have ample proof of them for them to have remained in business for this long. As iunderstood from your last reply Marrket Health is completely legitime affiliate program which doesn't harm customer's health who buy their product? > customer's health who buy their product? That isn't what I said. I said that their affiliate program appears to be robust and legitimate, but that as with any other potential business decision you should contact them for more information. Whether their products harm consumers or not is not something I can answer unless I actually go through the process of purchasing and ingesting the products they sell, which I'm not currently inclined to do. If you want to find out for yourself, go right ahead. That and: stop posting anonymously on my blog. My general rule is to not post anonymous comments. Keep that in mind. No more posts lately due to the fact that my main work has occupied more of my life lately. Also: lots of the stuff I've been investigating remains in an incomplete state at the moment. I have a new post coming soon. Honest. Thanks for the comment and your (I think?) kind words.